We have designed and supplied graphics for many exhibition and conference stands of all shapes and sizes for many years. We have a good relationship with exhibition stand design companies and suppliers of smaller portable stands. So what ever your requirement, Market Link can quickly solve your exhibition needs, providing effective designs with stand-out. In collaboration with exhibition designers Large, we supplied design assets for this innovative launch stand for a new boiler launch for Worcester, Bosch Group. Launch stand detail, the design based on a the product packaging for the new boiler. Areas within the stand were designated for installers to test their installation skills. A mobile Assa Abloy stand designed for small events. The design had to showcase two products, be also be flexible enough to be able to show just one or show both products separately. We designed the graphics for the Salts Orthotics division reception area and subsequent treatment rooms based in Birmingham. 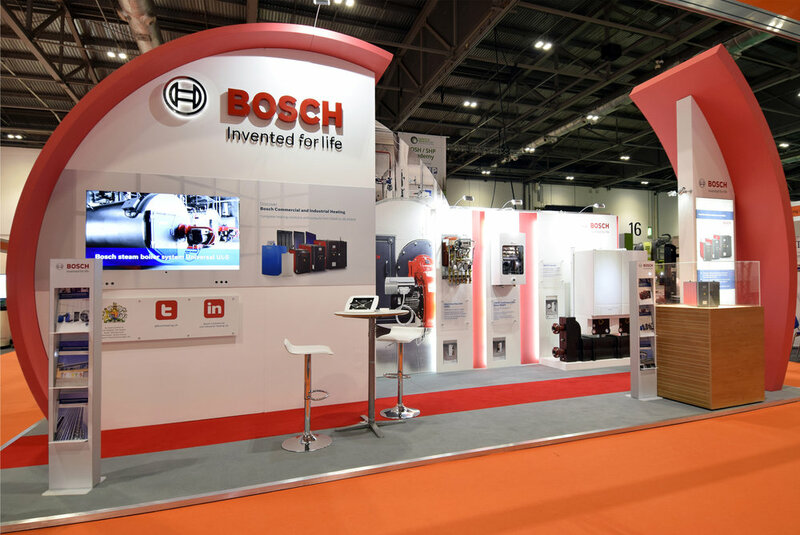 We supply design assets for Bosch Commercial stands that are at events all over the country.